IRS registered 501 (c) (3) Indian charity since 1988! 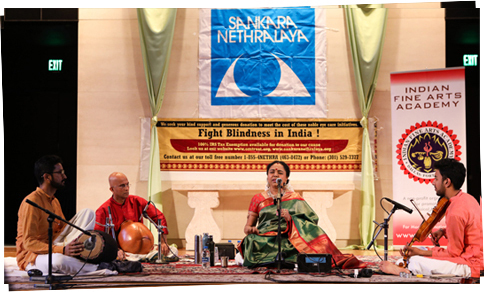 On a cold day of Spring on the March 31, 2019 Sankara Nethralaya Ophthalmic Mission (OM) Trust joined forces for the third time with the Indian Fine Arts Association (IFAA), Dallas to present the 2019 concert by Padma Bhushan, Mrs Sudha Ragunathan for Dallas / Fort Worth Metroplex, Texas, USA. Approximately 500 Dallas musical rasiga’s were warmly welcomed by Mr. Santhanam Mullur, Former Trustee, Sankara Nethralaya OM Trust, USA and the objectives to raise funds for providing free surgeries to the indigent at home. The new SN OM Trustees Dr Narasimha Reddy Urimindi and Nani Iswara were introduced to the DFW community by Mr. Mullur. This was followed by a brief Video presentation of Sankara Nethralaya’s community service activities. Dr Sujatha Subramanian, President, IFAA, Dallas warmly welcomed the community as well and introduced the profile of Padma Bhushan, Mrs Sudha Ragunathan and upcoming eminent youngsters Kamalakiran Vinjamuri on the violin, Akshay Anantha Padmanabhan on the Mridangam and Soumiya Narayanan (Trustee of Sankara Nethralaya OM Trust) on the Ghatam. Mrs. Sudha Ragunathan rendered songs that MLV Amma used to sing, Muthuswany Dikshithar and a vast collection of other songs to treat the Carnatic Music rasigas with a brilliant demonstration of her skill, versatility and unique style. Vote of Thanks was presented by Dr Narasimha Reddy Urimindi, New Trustee of Sankara Nethralaya OM Trust thanking the IFAA committee members, IFAA volunteers, SN OM Trustees and volunteers and Donors that supported the event by their warm attendance and donations to support the needy at home with free eye surgeries.